The lava walk at Arenal National Park is a unique opportunity to experience an active volcano in all its magnificence. The walk itself is a leisurely half hour walk arriving at an extensive lava field, formed in the massive explosions of 1968. Once on the lava, the proximity of the volcano is breath taking. The volcano is constantly spewing lava. House sized boulders can be seen careening down the sides at tremendous speeds. It makes a sound like a large dump truck spilling a load of gravel. Personally I’ve done the lava walk four times and each and every time I am awe struck yet again. thank you so much for posting this. I have been looking for recent information on lava flow at Arenal. We are planning a trip in January. Can you tell me the last time you were there? Hello Katie. I live in the area. We have two climatic seasons in Costa Rica. Rainy and dry. 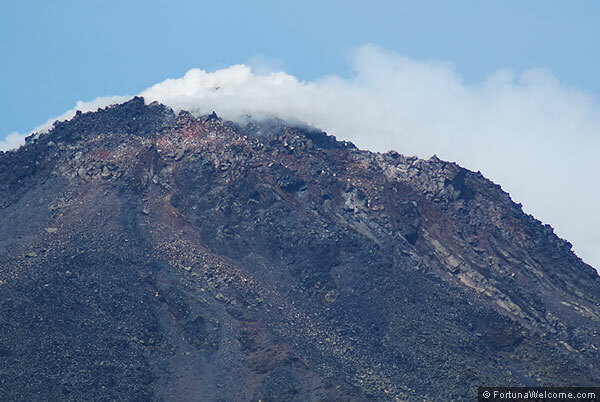 It’s more common to see the Volcano cleared in the mornings, around 6am.